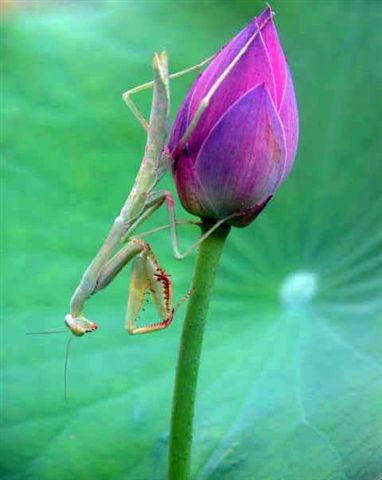 The genus Nelumbo generally has two species, namely H. nucifera, Gaertn (China lotus with pink or white flowers) and the other is American lotus with yellow flower (N. pentapetala (Walter) Fernald). Both are in the order of Nymphaeaceae. Nelumbo nucifera and N. lutea. Nucifera are the old-world species and the ones cultivated and eaten the most. N. lutea is North American but aside from its yellow color seems to be very similar to Nucifera. The tubers are the most commonly eaten part. When sliced across they look a little like sponges with large cavities. These are often stuffed with a filling, then battered and deep fried. The seeds are also eaten. When they're fresh, there's a controversy about whether the green embryonic shoot should be removed or not. The dry seeds can be popped like popcorn. The leaves can be used to wrap food that is then steamed or baked, but they generally aren’t eaten. Lotus grows in shallow water -- depths of a few inches to a few feet. It can be grown in pots or 1/2 whiskey barrels or in ponds 18 inches deep. The tubers grow about 6-8 inches under water. 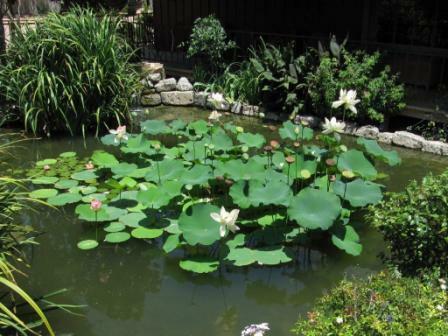 Growing in natural ponds or lakes, they'll form large colonies. Lotus has three kinds of leaves. When the leaf is in its first stage floating on the water surface and small, it is called a coin leaf. When fully grown it is called a floating leaf. When it extends on its stalk above the water it is called a standing leaf. The flowers are bisexual, having both the filament and the ovary. The color and shape of the flowers vary with the different cultivars. The Indian lotus flower is a symbol of enlightenment in Buddhism. It grows in muddy water and sprouts a flower stem to produce a very beautiful flower. This fact reminds Buddhist people that Buddha was born in this (dirty) world and got enlightenment at the end. When you visit Buddhist temples, you can see the sculptures of Buddha sitting or standing on lotus flowers. In 1951, three lotus seeds were found in remains of houses, some 2000 years old.. A botanist, Dr. Ooga, tried to germinate them but only one seed grew to later produce flowers. This lotus is now called "Ooga HASU"(= Ooga's lotus), and the offspring are raised by enthusiasts all over Japan. Asian people utilize all the portions of lotus; we eat lotus roots and seeds, wrap up food with lotus leaves, and make tea of lotus leaves. Lotus is a really useful plant. From the Lotus.com website. Fruit generally includes both the seeds and the hull. It is the developed ovary and the ovules. The seeds are hard and eliptical. Generally the seeds are 1.6-1.8 cm in length and 1.1-1.2 cm wide weighing between 1.1-1.4 grams. The shell around the seed is very hard. After the shell is removed, that becomes the seed inside the seed coat which can be brownish red or tan color. Commercially it is the red or white lotus seed. The seed also has the cotyledons and the germ which is in an air space. Stir fry pork , garlic, ginger and scallions till pork is opaque in color, add the lotus root , and the water , and the rest of the ingriedents, bring to a boil, and simmer untill lotus root is tender. Serve hot. Answer: Physical removal is the most practical method. Lotus will make a good ingredient for the compost pile. Hydrogen peroxide in a 10 percent concentration will work as a herbicide. Unfortunately, it is not available commercially in that concentration. You will have to purchase an even-more-concentrated form of hydrogen peroxide and then dilute it to 10 percent. Be careful because concentrated hydrogen peroxide can burn your eyes and skin.